At the Institute for Preparing Heirs, we coined the term The Great Wealth Transfer, to describe the trillions of dollars transferring over the next several decades from spouse to spouse and spouse to children and grandchildren and others held dear. However, most wealth transfers do not go well. Assets are lost and family harmony is disrupted, often permanently. Even the best investment and estate plans cannot shield a family (and it assets) from unresolved issues. 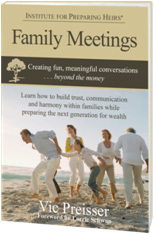 Family meetings provide a forum for members to build trust, open channels of communications, share common values that help give purpose and meaning for the family wealth, practice joint decision making and prepare the heirs for their family roles—all key contributors to successful wealth transfer. A successful wealth transfer for families occurs when heirs receive and manage assets in a manner to foster their development and lifetime goals. Affluent parents are concerned about the successful transition of wealth to their beneficiaries and are looking for ways to prepare their heirs and to ensure their family remains close through the generations. Even the closest of families change over time—parents age and children marry and form households of their own. When properly conducted, family meetings bring everyone closer together—parents, grandparents, children, grandchildren and spouses—by focusing on topics of interest to the entire family and its future. As their trusted advisor, suggest to your affluent clients a new holiday tradition— an annual family meeting on the topic of giving— around the dinner table or in front of the fire—where members share a cause or non-profit organization close to their hearts. By sharing what family members are passionate about, these conversations can foster the spirit of giving and gratitude. Our experience shows that family giving promotes family harmony and helps preserve family values through generations. 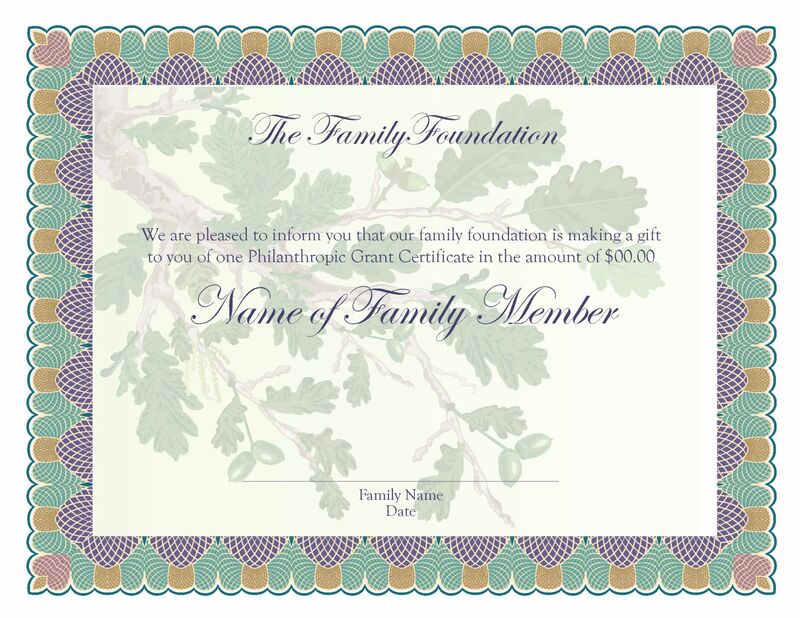 Suggest that parents or grandparents issue grant certificates as holiday gifts. Each family member, including spouses and children, has a specific amount to give to the cause or organization of his or her choosing. During the family meeting, members share what is special about their causes and why they are compelled to support these organizations. If one family member makes a great case for what he or she is passionate about, maybe the whole family will join together to give all their money to the same cause. Families may want to select an organization to visit during the year as a family. It's a great opportunity for the family to spend time together learning more about how their generosity helped the organization they gave support to. A family meeting focused on giving is a wonderful way for parents or grandparents to demonstrate how blessed the family is by helping others. As the trusted advisor to affluent generational families, you have an opportunity to introduce your clients to family meetings, and offer guidelines needed to have their first family meeting this holiday season. Through these conversations, the entire family can learn to embrace the legacy of giving for future generations.